Banks really seem to be cracking down on debit card fraud this year. In August I received an email from my bank saying my MasterCard debit card had been compromised and I would be getting a new one in the mail. Yesterday (September 5th), I was attempting to pay for some car repairs and my newly activated debit card was declined. I called the bank and they told me that the new card I’d had for a few weeks had already been compromised. According to the bank, it was the Dairy Queen data breach that triggered the alert. (darn Blizzard addiction!) When this happened, my bank lowered the daily limit to $300. Luckily they were able to temporarily boost my limit so I could pay the fine folks at the repair shop. Changing debit cards is a bigger pain because you have to remember all the places online that you use it. When I got my replacement card in August, I forgot to update my account info with Netflix and was shut off. (give me my Orange dang it!) 🙂 I pay most of my bills online via the debit card and having to frequently change the info is making the convenience of a debit card not so convenient anymore. 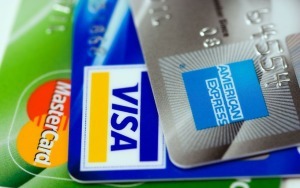 What should you as the consumer do to reduce your chance of getting your card compromised? This is a good strategy especially if you’re budgeting with the envelope system, but doesn’t help for online purchases. However, I don’t like carrying wads of cash in my wallet for safety reasons. I already have several bills like power and water setup to go through my bank instead of my debit card to avoid processing fees. It takes a few days for them to process, but it might be worth it to ensure they get paid. While this won’t completely eliminate your card getting compromised, it might reduce the threat. It might also help you manage your money better from a budgeting perspective. Of course if the online company gets breached, then you’re still vulnerable. This may sound like overkill for some folks, but you should check your bank account at least once a day. Some people check their Facebook or email when they first get up but I check my bank account. That way you’ll know instantly if there is a weird charge and you can take action to reduce your money from being taken. Note: Neither time that my card was compromised did I see any invalid transactions. The bank is just being proactive by issuing new cards to reduce risk to both their customers and the bank itself. Have you had a debit card compromised by one of these recent retailer hacks? Which store was compromised for you? Do you have any other tips to reduce your risk of being compromised? Share your story in the comments below.